Dasylirion leiophyllum has the most limited range of the three US species of this genus, found in the Chihuahuan Desert of west Texas and far south New Mexico, though in these areas the species is common and widespread. Older specimens form trunks up to three feet tall, growing upright, or more usually, at an angle. 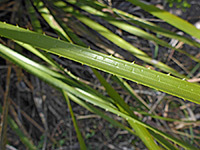 The numerous bright green leaves are up to 40 inches long and about one inch wide; linear in shape apart from at the base, which is somewhat broader. They are lined by a regular array of small, well-separated, brown-tipped teeth, generally angled backwards.